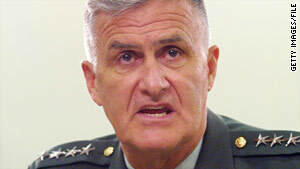 Gen. Hugh Shelton's book says a card with nuclear launch codes went missing during the Clinton presidency. (CNN) -- A former chairman of the Joint Chiefs of Staff says in a new book that while Bill Clinton was in the White House, a key component of the president's nuclear launch protocol went missing. "The codes were actually missing for months. This is a big deal," says Gen. Hugh Shelton. "We dodged a silver bullet." In his book "Without Hesitation," the retired Army general writes, "Even though movies may show the President wearing these codes around his neck, it's pretty standard that they are safeguarded by one of his aides, but that aide sticks with him like glue." He adds that President Clinton "assumed, I'm sure, that the aide had them like he was supposed to." What apparently went missing was a card with code numbers on it that allows the president to access a briefcase -- called the "football" and kept by an aide always near the commander in chief -- containing instructions for launching a nuclear attack. Once a month, Defense Department officials conduct an in-person verification to make sure the president has the right codes. At least twice in a row, Shelton writes, a White House aide told the Pentagon checker that the president was in a meeting but gave a verbal assurance that the codes were with him. Then one month around 2000, according to Shelton, when the time came to replace the codes with a new set, "the president's aide said neither he nor the president had the codes -- they had completely disappeared." Shelton writes that all this happened likely without Clinton's knowledge. CNN called and e-mailed a spokesman for Clinton on Thursday, but there was no immediate response. Fran Townsend, who was homeland security adviser to President George W. Bush and who is a CNN contributor on national security issues, said Thursday, "I can't imagine a more serious breach, if something like that were ever to be lost or be compromised. "That's the command and control capability of the president to launch a nuclear attack." But if an unauthorized person found or obtained the codes, she said, it is unlikely that he or she could execute a launch, because they are only one part of the launch protocol. Another part of that protocol is the "football," containing the launch instructions. Townsend said it's a multilayered system. "Even if you had a piece that was required, it would be very difficult for one person to execute the command and control of this thing," Townsend said. "There are plenty of things to be concerned about. I just find it difficult to imagine somebody could execute this thing, if they found a piece to it." Shelton said the president was given new codes within minutes when the previous codes could not be found. He said the procedures have been changed since then so that the Pentagon aide who carries out the monthly check is required to wait at the White House until he or she can visually confirm the codes are in the president's possession or an aide who is with him.